*Please note: We offer rates on 1 to 4 bedrooms. Rate provided by calculator is based on 1 bedroom rate. Please see complete rate schedule below. Located on the French side of St. Martin in the exclusive area of Terres Basses (The Lowlands), Mille Fleurs is a spacious and private colonial-style villa set on two-and-a-half secluded acres of lushly landscaped grounds. Perched just above the tranquil waters of Plum Bay, Mille Fleurs offers breathtaking panoramas of the Caribbean Sea, the Atlantic Ocean and the islands of Saba and Anguilla. When the sun sets, enjoy cocktails around the pool and marvel at the Caribbean night sky revealing a symphony of stars. As a romantic setting, Mille Fleurs is unsurpassed -- Serenity and privacy beckon those seeking a luxury retreat -- the perfect setting for a romantic vacation. The pool area, with its sweeping vistas, offers complete privacy for that perfect all over tan or romantic midnight swim. In addition, Mille Fleurs has all the amenities of home, including air conditioning, satellite television, DVD players, sound system with I-POD docking station and high speed wireless internet service. The kitchen is fully stocked and equipped -- perfect for whipping up a romantic dinner to enjoy poolside. The Master Bedroom features a king-size antique four-poster bed, a spacious bathroom and separate dressing area with ample closet space. The other three guest bedrooms have en-suite bathrooms as well. As part of your experience at Mille Fleurs, daily maid service is provided (Monday through Saturday) and laundry services are available. For your beach outings, Mille Fleurs provides beach chairs, umbrellas and coolers. Mille Fleurs is centrally located -- Whether you're interested in sunning, shopping, golfing or gambling, you are just minutes by car to the shops and restaurants of Marigot and Simpson Bay, the casinos of Cupecuy and Maho and the greens of Mullet Bay golf course. While St. Martin has many beautiful beaches to choose from, Mille Fleurs is just a five minute walk to beautiful, secluded Plum Bay. Pack a lunch, take the beach chairs and enjoy the peaceful tranquility of Plum Bay. Soaps and shampoos are provided and all bathrooms have hair dryers. Mille Fleurs offers breathtaking panoramas of the Caribbean Sea, the Atlantic Ocean and the islands of Saba and Anguilla. Laundry services are available through Heither, the housekeeper. She can offer basic washing and drying of one or two loads of your personal laundry per day. Mille Fleurs has a full service of dishes, glasses and silverware- as well as serving bowls, platters, trays, baking dishes, etc. The kitchen at Mille Fleurs is fully equipped for even the most extravagant culinary experience. Completely stocked with a full array of pots, pans, serving bowls, platters, trays, dishes, etc. Mille Fleurs has two dining areas- a breakfast table for casual dining as well as a more formal dining table that seats 10. Both tables are outdoors under cover to allow for dining with a water view. Each bedroom has its own TV. And there is a TV in the living room. Mille Fleurs provides American DISH TV satellite programming. There is a sound system with speakers in throughout the common areas and the pool area. The sound system is equipped with an ipod/iphone docking station so you can enjoy your own music. Mille Fleurs has a selection of over 100 books in our library cabinets. Mille Fleurs has a game table for checkers & Backgammon as well as a full selection of board games, dominoes, etc. Mille Fleurs has a music library consisting of a few hundred CDs covering a full range of genres such as Pop, Jazz, Classical, Western, Broadway, Dance, Easy Listening, etc. Mille Fleurs has a full array of over 100 DVDs available for our guests to enjoy. The pool area at Mille Fleurs is equipped with very plush upholstered lounges and chairs spread around the expansive outdoor deck area- providing many seating areas both covered and uncovered. Mille Fleurs is located just 15 minutes from the Mullet Bay Golf Course- the only golf course on the island. Enjoy the cool clear waters of the 20' x 40' infinity-edged pool overlooking the beautiful Caribbean Sea. This was our second trip to Mille Fleurs. We enjoyed this trip even more than the first one! We had a better feel for the island and loved exploring the beaches and restaurants. We have already booked our next trip and know it'll be just as great as our first two! We first visited Mille Fleurs three years ago and my husband and I and our daughters couldn't wait to return. The photos don't do it justice. Everything is so beautiful AND clean, the view is breathtaking, the pool and super comfy lounges are fabulous, the pool floats are heaven, the beds are comfortable and the sheets are so nice (and ironed by the incomparable Heither.) What more could you want? Maybe a fully stocked kitchen with 2 refrigerators,covered porches, cool breezes blowing in from the Caribbean, a view of Anguilla (which you must visit), sunsets that rival a National Geographic photograph, privacy in a guard gated community with a gated wall around the property, ocean breezes blowing through the house day and night as the back of the home is never closed, and an owner who is so caring (about the property and his guests) that he answers every email promptly and meticulously. If you come you will return. That is the true measure of a wonderful property--you love it enough to come back again. From the moment you enter the door and step down the steps into the grand parlor, you are captivated by the spectacular views of the surrounding ocean. The parlor itself is tastefully decorated with somewhat of an opulent decor. Three oversized open french doors seem to beckon you forward to draw you out onto the magnificent columned terrace where you are greeted by an unbelievably panoramic view. The rest of our party, which included my family of 5 and 2 very dear friends, continued on to tour the estate while I remained on the terrace taking it all in. I sat down in a shaded pavilion overlooking Terres Basses and all it has to offer while listening to breeze blown palm leaves and doves cooing all about. It resembled a dream or romantic movie from long ago. Unbelievable! I decided to rejoin the group and explore the villa. The master bedroom was magnificent, fit for a king and queen with its 4 post canopy bed including an amazing amount of closet space - I only wished we had packed for a stay of several weeks. The remaining 3 bedrooms were all located on the far right wing of the villa and were equally splendid in decor and comfort. A super equipped kitchen with 2 refrigerators and a stocked bar were our next visit on the tour. It was at this point that we decided to reconvene on the terrace and begin the relaxation portion of our vacation by comfortably lounging around the pool, swimming and floating in the cool waters and having cocktails under the pavilion. We were notified that it was Easter Monday (rendering many businesses closed) which only further solidified our decision to remain at the villa. As the sun set and the peepers began to sing to us, the lights magically lit up the pool and outdoor living space, enhancing the experience to an even higher level. And we lived like this for 7 nights and 7 days! The owner, Jack, worked with us on many aspects of our trip in a very professional yet personal manner. He was quick to respond to any inquiries and very thorough with the information he provided. Thank you, Jack, for allowing us to share your beautiful estate in all of its exuberance and grandeur. What a magnificent vacation! The pictures don’t even do justice to the villa. Wherever you look is a pleasure for the eyes, whether it is the villa itself or the view. Every moment is magic. It starts at the airport where a taxi is sent to drive you to the house where the housekeeper, the gardener and the representative of Sotheby’s - who manages the house on site - greet you and give you all the information necessary to make sure your vacation starts immediately. The house is tastefully decorated and in excellent condition. The extremely comfortable beds meet a five star hotel standard. Each bedroom has its own TV and ensuite bathroom. Plenty of comfortable areas to sit inside and outside. There is a stereo system with adjustable speakers for the living room, kitchen, dining area and swimming pool. Plenty of DVDs and CDs are even provided. 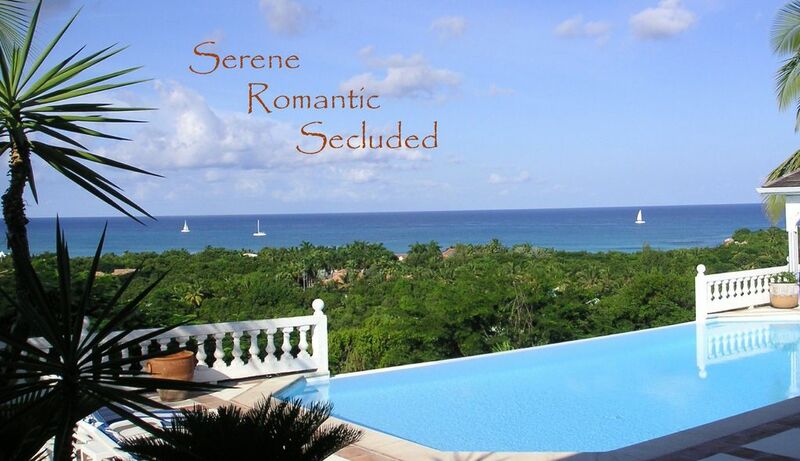 The location is safe in a gated community, actually in the most secluded area of St. Martin. Plum Bay beach is exactly 450 yards from the house. The swimming pool is not heated but around 80°F in December. Heither, the housekeeper, comes 4 hours each day – except Sundays – to clean the house, make the beds and change the towels. Lots of supermarkets with French and American products a short ride away. Private catering can also be arranged. Altogether it is like renting a private villa with the service of a hotel, staff being at your disposal if needed. As the house was not rented until the next day, we could even stay until our plane departed mid afternoon and enjoy an extra and last day of vacation! Jack the owner is very responsive and will check that everything goes smoothly, even when you are back home. Our deposit was returned within 48 hours. We are used to renting properties but this one was definitely the best. We can’t wait to go back! Our family of 6 (Children ages 23, 20, 17, 13) stayed at Mille Fleurs for a family vacation. Jack was great to work with and very helpful. We were scheduled to go last July but had to cancel 2 days before departure due to a life threatening illness that happened to my husband. Thankfully, he recovered after a 4-month ordeal! Jack was kind enough to keep the house available for us this summer and even gave us an extra day! Needless to say, this vacation was very sweet for our family and Mille Fleurs was a perfect place to relax and enjoy our family. The photos are no lie...it looks exactly that gorgeous! The view is breathtaking, the pool is large and perfectly maintained. The beach is just a short walk away. It's clear blue waters are soothing to eyes as well as the body. The temperature is ideal for swimming or just wading. We felt very safe there and really loved not hearing any traffic or having any highways to deal with...a true getaway. We ate out a few times during our 10-day stay but really just had fun, shopping at the Super U in Marigot and cooking dinner at home. There is a nice grill and well-stocked kitchen with everything you could want to make a meal, then serve it on nice plates and flatware. There are all kinds of glasses for your beverages, too! We also went to 1 of 2 nearby French pastry shops in the mornings for bread, croissants or pastries...delicious! One thing I loved about being there was having the feeling that we were outside most of the time...even when we were cooking, watching TV or playing games, we could where our bathing suits all day. The bedrooms/bathrooms were air-conditioned and perfect for a great night's sleep. Heither came everyday to bring fresh towels and clean up after us, which was a total luxury since we never have that option when we go to the Outer Banks. We did have to use the bug spray a lot, but it was provided there for us. In all, we had a trip of a lifetime as a family, and we will remember it for years to come. We hope that we will be able to go back again someday in the future. Thanks again!